Is your roof tired and in need of repairs? Perhaps you need a new roof installed entirely? Let us help you find a qualified roofing contractor! Search through our large database of rooing contractors today to find someone in your area to make sure you and your loved ones are kept dry and warm. If you're not familiar with roofing, you can peruse our articles to get a better idea of some roofing considerations that may apply to your home or office. Did you have a good experience with one of the roofers listed on our site? Why not take the time to write a review of the roofing services they provided you with to let others know, here on Roofer-Locator.com. If you are an experienced roofing contractor looking to promote your business, click the link at the bottom that says "Add Your Business". 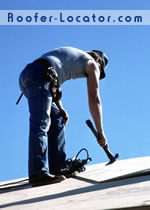 There is no cost involved with promoting your roofing business on Roofer-Locator.com.